1) Keep yourself and your house looking and smelling good. You don’t know what pleasant looks and sultry aromas your man is encountering out there on a daily basis (at work or in the clubs). 2) Be “present” in the relationship. When he’s home, laugh with him, talk to him, play a game of cards with him. Sit beside him on the sofa, and share a cocktail him. That’s what she does. 3) Give him space. Don’t forsake getting together with your “girls”. Join clubs or organizations that will give you something to do, and somewhere to go. Show him attention, but don’t smother him. Let him wonder where YOU are, sometimes. 4) When your love gives you a wearable gift—even if you don’t like it—make sure you wear it when the occasion is appropriate. 5) Shop the cheap stores for pajama sets. Throw away the bottoms or tops if they look too chintzy. Outfit the more expensive looking part of the set with an appropriate, more costly counterpart. Lounge around the house in the new outfit. 6) Stock your shelves with the non-perishables that men like to eat—canned tuna, canned crab meat, canned smoked oysters, canned soup, canned beef stew, canned chicken, for quick patties, etc. 7) Learn how to cook his favorite dishes. Actually cook them. Make your house cozy and warm with with the smell of homemade food. Once, I asked a newly-wed friend at work, what made his young wife stand out. He said that when he came home and had to look for her, because she was so engrossed in something that she liked to do, and hadn’t heard him drive up, or walk through the door, she was the most appealing—as opposed to the times when she stood in the doorway waiting for his arrival, kissing and hugging him when he came home, and asking what his desire was for dinner. Of course, I didn’t say anything (he was too young to understand it, anyway) but I guessed those were the times when the hunter side in him came out. Men are hunters you know, they like to seek and find. I serve most of my banana pies in a pretty dessert dish, not sliced on a pie plate; it just looks so feminine that way. When I serve something in an ornate dessert dish, people always think I’ve been in the kitchen all day. To make the crust, in a medium-sized bowl, crush the vanilla wafers. Mix the crushed wafers with the granulated sugar, brown sugar, and salt. Add the melted butter and vanilla extract. Using your hands, mix the ingredients together well, to incorporate them. Firmly press the mixture on the bottom and up the sides of a 9-inch pie plate. Place the vanilla wafer pie crust in the preheated 350-degree oven. Let it bake at 350 degrees for 8 to 10 minutes, or until the crust is lightly browned. Take the crust out of the oven and let it cool on a wire rack for about 10 minutes, or until it is cooled completely. While the crust is cooling, make the banana pie filling. To make the filling, in a heavy saucepan, stir together the milk, evaporated milk, and butter. Stir until the butter is melted and well-incorporated into the mixture. Stir in the eggs, egg yolks, cornstarch, granulated sugar, and salt. Cook over medium-low heat, stirring constantly, and vigorously for about 10 minutes, or until the mixture just begins to softly bubble and reaches the thickness of pudding. NOTE: The mixture has to be thick enough to hold soft peaks when you lift the spoon, in order to set properly. Remove the mixture from the heat. Stir in the vanilla extract. Spoon the filling into a chilled, medium-sized bowl. Cover the bowl with plastic wrap. Make sure you press the wrap directly on top of the pudding so that it doesn’t form a “skin” on the top. Place the bowl in the refrigerator until the pudding is completely cooled. When the pudding is completely cooled, take it out of the refrigerator. Place an even layer of sliced bananas over the bottom of the cooled crust. Spoon half of the banana pudding mixture over the bananas. Place the remaining vanilla wafers evenly over the pudding. 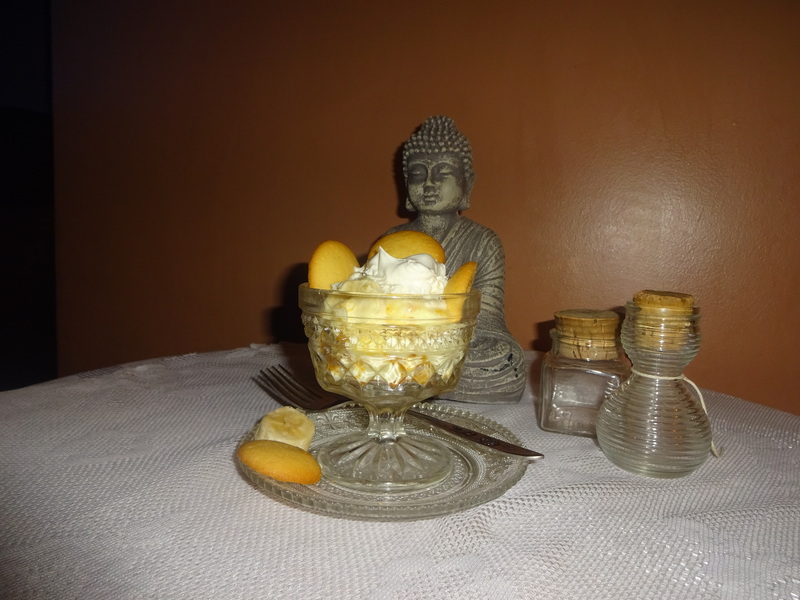 Spread the remaining banana pudding over the wafers. Return the pie to the refrigerator and chill for about 4 hours. 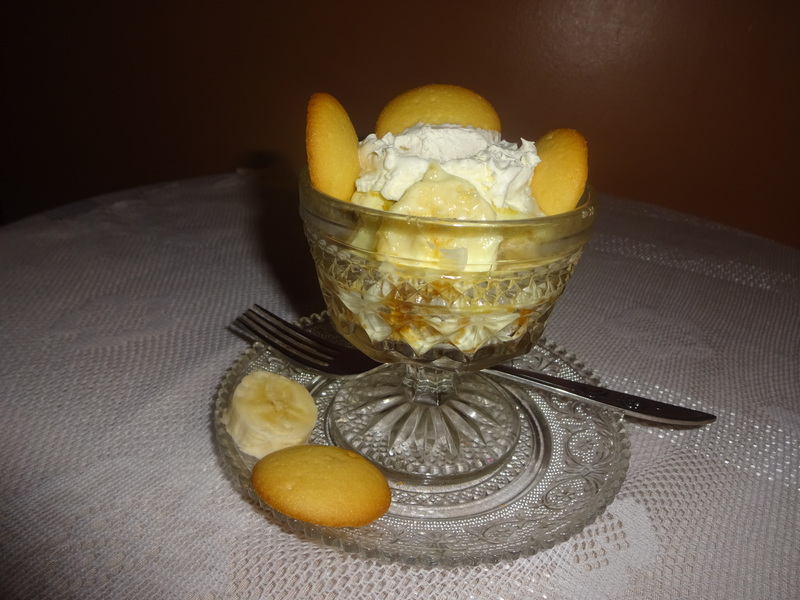 To really impress, spoon a dollop of home-made whipped cream with a banana slice and a vanilla wafer on top of each serving. This pie also tastes good with a meringue topping. Makes One 9-inch banana cream pie. In the bowl of a mixer fitted with a whisk attachment (you can do it by hand, using a large whisk, or in a glass or metal bowl, using a hand mixer) add the chilled whipping cream, and whip it on high, until light and fluffy peaks begin to form. Reduce the speed to medium-high. Add the confectioners’ sugar, salt, and vanilla extract. Continue to whip the cream until it reaches the consistency that you desire—some people like soft whipped cream, while others prefer a stiffer topping. Makes about 2 cups of whipped cream. I think about Delta Sweeney a lot, especially when I’m baking. She and her husband, Douglas, lived around the corner from us, in the old Mansfield house. Miss Delta was short and pudgy; Mr. Douglas was short and round. I remember him going to, and coming home, from work. And eating all of his weekday meals inside a slanted, enclosed sun porch, on a worn, leather recliner that had been placed in front of a folding food tray, and an old television set. In stark contrast to the rest of the spotless house, Mr. Douglas’s sun porch was littered with timeworn newspapers and fishing magazines, and smelled like a years-worth of cigar smoke. I don’t remember Miss Delta for her home baking; especially, for her home-baked sweets. When I think of her culinary skills, what comes to my mind, are her delicious soups and stews, her well-seasoned meats, her delectable stove-top corn breads, and her beautifully laid out shelves—they were always full of store bought cookies, candy boxes, and packages of store-bought pie crusts. I also think about her wonderful ability to take a store-bought dessert and rearrange it so that it looked, and tasted, homemade. For instance, she would add chopped nuts and fruits to store-bought cookie dough and you would never know that she hadn’t made the cookies from scratch. She would buy plain cupcakes and top them with her own glaze, to give them a warm and delicious, and homemade look and taste. And she would run the backside of a large spoon around the edges of her store-bought frozen pie crusts, to give them that homemade look and taste. Sometimes, she just trimmed off the machine-made crimps on frozen pies, altogether, and fashioned her own. I remember Miss Delta saying that most of her sweet things came from farmer’s markets and Mom and Pop bakeries. Now that I’m older, and a home cook myself, I realize that those are the places that carry the best smelling, and looking, hand-made goods. One day. while my mother and Miss Delta sat in the living room, having one of their wifely conversations—Miss Delta was older than Mama, and gave some enlightening, womanish, insights—I remember sitting at Miss Delta’s kitchen table, munching on a helping of the delectable store bought treat that she had set in front of me—if I’m not mistaken, she had placed a dollop of softened, vanilla ice cream between two soft, store-bought oatmeal cookies, and called them ice cream sandwiches—and thinking that one day, I would buy all of my desserts from the store and refashion them, the way that Miss Delta did, so that they would taste and look delightful. And homemade. Mama knew pies, and she knew that Miss Delta had made hers with store-bought fillings and store-bought crusts, but she would tell me that once Miss Delta put her special touches on hers, she made the best homemade pies in town. Once, my mother said to me, “For one reason or the other, not all women cook. If a woman doesn’t cook, that’s okay; as long as she knows where to go to get good-looking food, and how to arrange it in her cupboard, so that it looks good to eat.” For me, the statement clarified so much of what I loved about Miss Delta’s deliciously-arranged, store-bought cabinets, and it enlightened me further, about the influence that good scratch food, made on a person’s mind. It was suddenly clear to me—that men were natural hunters…and that women, by nature’s design, were food gatherers. Good cooks, are the women who know how to stock their shelves in an alluring way…they know how to plate their food so that it looks and smells enticing. And if they don’t cook, they know what to gather, and where to shop to get it. Women are gatherers. This after-work pie is perfect for working women who want a quick and easy dessert to accompany a week night meal, and stay-at-home women who are raising small children, and need a Zen moment away from it all. Men love this pie. But we all know that we shouldn’t tell one all of our little secrets…in other words, he may love the pie, but he doesn’t have to know how easy it was for you to make. In a large bowl, combine the apple pie filling and brown sugar. Gently, blend the brown sugar into the pie filling. Sprinkle the mixture with the ground cinnamon and ground nutmeg. Gently stir in the vanilla extract. Line a glass pie plate with the bottom pie crust. Brush it with the egg white to keep it from getting soggy. Let the egg white dry. Spoon the seasoned filling into the pie crust. Dot the pieces of butter, evenly, over the entire pie. Unfold the second pie crust over the apple pie filling. Trim the overhang to about ½ to 1-inch. Fold the top and bottom crust edges together, folding them downward, to create a seal around the edges of the pie. Using your fingers, or the tines of a fork, crimp the edges. Brush the top of the pie with the glaze. 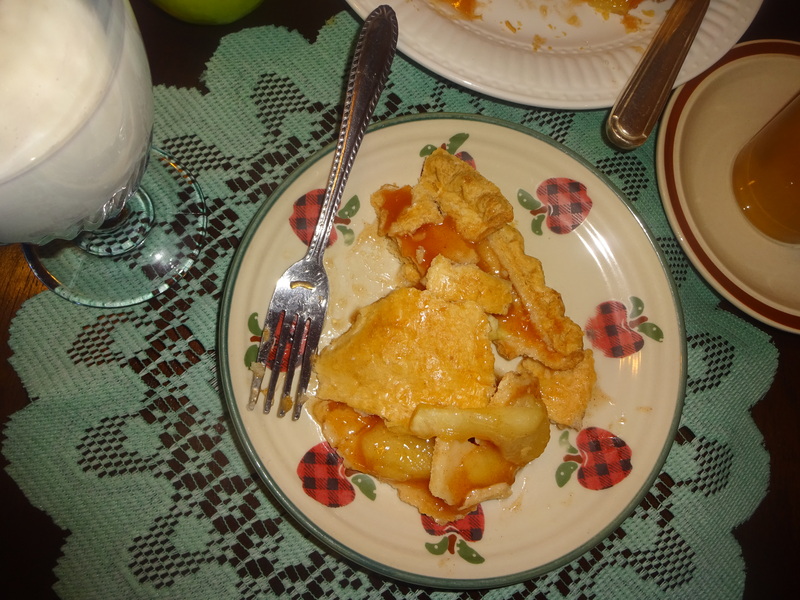 To make the apple pie glaze, in a small bowl, whisk together the large egg yolk and milk, or heavy cream if you desire. Whisk well. In a separate small bowl, whisk together the granulated sugar and the ground cinnamon (the ground cinnamon is optional), until the mixture is well-combined. Lightly brush the egg yolk mixture over the top of the pie. Evenly sprinkle the cinnamon sugar mixture over the top. Using a small paring knife, cut 3 to 4 slits in the top of the pie to allow the steam to escape. Place the pie on a baking tin to catch any spilling. Then, put it in the preheated 350-degree oven. Bake the pie at 350 degrees, for 35 to 40 minutes, or until the pie is nicely browned and the filling is bubbling through the slits. Take the pie out of the oven and let it cool completely on a wire rack before serving. NOTE: You can fit the pie with a pie shield, or a ring of tin foil to prevent the edges from over browning. Also note: I glaze the tops of all of my double-crust pies, to get the pretty shine and rich color that sets a good pie apart. Sometimes, when I take my double-crust pie out of the oven, I thin ¼ cup of light corn syrup with a small amount of hot water, and brush the tops with the mixture, then sprinkle it evenly, with about 1 teaspoon of granulated sugar. I put the pie back in the oven for a couple of minutes, just to let the mixture set. Makes One double-crust apple pie. To me, bread pudding is a classic comfort food dessert. My mother made it often, and each time she did, she would tell me that hers was never as delectable as was her mother’s sister, Bulah’s. Mama would compare her feelings for Aunt Bulah’s bread pudding, to those of someone who’d gone off to college and missed the taste of their mother’s cooking back home. She would tell me that whenever she went to New Orleans, where Aunt Bulah owned and operated her own, neighborhood grocery store, bread pudding was the first thing that she requested. Whenever I make bread pudding, or eat someone else’s, I think of Aunt Bulah, and how Mama mourned the taste of her aunt’s pudding. I also think of the little dresses that Aunt Bulah had a well-known, local seamstress make for me while we were vising one Holiday season. It was my birthday and Christmas—my birthday is four days before Christmas—and there was no snow in New Orleans, to play in. I remember pouting and fidgeting during my sittings and not being pleased at all…to be honest, I remember being quite disgusted with the whole thing. I had just turned four, and the dresses were Birthday gifts for me. To make matters worse, Aunt Bulah gave me an engraved flatware set for Christmas—not the toys I had envisioned. My saving grace was the “big” Christmas gift that my parents had waiting for me when we returned. Back at home, my father met us at the train station, grinning like a cat. My “big” surprise turned out to be a newly painted bedroom, a new canopy bed, and a little girl’s vanity table. I remember crying like a broken faucet. In my mind, it was the worst birthday and Christmas ever…no stuffed dolls, or crayons and coloring books, or play tea sets. For some reason, the smell and taste of bread pudding always whisks me back to my childhood. I sure hope my parents and aunt, know that I think of them and their love often. I hope when they’re sitting back, reminiscing about their lives here on earth, the memory of a little child pouting because she didn’t get the toys, or the Holiday snow that she had wanted, is as funny to them, as it is to me. I wonder too, how many of us are still pouting, still overlooking the sweet things that people do to show us their love, like…shoveling the snow, mowing the lawn, washing the car, cleaning it out, fixing a leaky faucet, oiling a squeaky door, carrying in the groceries, sitting with us when we’re sick, making the decisions we’d rather not make…. In a heavy saucepan, over low heat, combine the heavy cream, unsalted butter, and granulated sugar. Bring the mixture to a boil, whisking until the sugar is dissolved. Add the cocoa powder and instant coffee granules. Add the light corn syrup and salt, whisking until each ingredient is dissolved and incorporated into the heavy cream. Continue to whisk the sauce, until it is smooth. Remove the sauce from the heat. Stir in the vanilla extract. Serve the sauce, warm, over the chocolate bread pudding. Makes about 2-½ cups of chocolate sauce. Preheat the oven to 350 degrees. Lightly grease a 13-inch-by-9-inch glass baking dish. Set the dish aside. To make the bread pudding, arrange the bread cubes in the dish. Carefully, fold in the chopped walnuts. In a large bowl, thoroughly stir together the melted, unsalted butter, half-and-half, heavy cream, and ground cinnamon. Add the large eggs, one at a time, beating well after each addition. Add the large egg yolks. Beat the mixture just until it is mixed well. Add the granulated sugar, light brown sugar, cocoa powder, and salt. Mix well. Add the vanilla extract. Mix well. Stir the grated chocolate into the half-and-half mixture. Mix well. Pour the mixture over the cubed bread and nuts. Let the bread pudding stand, stirring occasionally, until the bread cubes absorb most of the half-and-half mixture. NOTE: I use the back of a large spoon to gently push the bread cubes down to help them absorb the half-and-half mixture more quickly. Place the pudding in the preheated 350-degree oven. Bake it at 350 degrees, for about 40 to 50 minutes, or until the pudding is golden brown on top and set in the middle; when the pudding is done, it should still have a slight wiggle to it, but a wooden toothpick inserted in the middle should come out clean. While the bread pudding is baking, make the chocolate sauce. Take the bread pudding out of the oven. Let it cool about 15 minutes, on a wire rack before serving. Serve with homemade chocolate sauce and a dab of fresh whipped cream on top. Actually, the pudding tastes wonderful, when you serve it cold, with warm chocolate sauce. To make the chocolate sauce, in a heavy saucepan, set over low heat, combine the heavy cream, unsalted butter, and granulated sugar. Bring the mixture to a boil, whisking until the sugar is dissolved. Add the cocoa powder and instant coffee granules. Add the light corn syrup and salt, whisking until each ingredient is dissolved and incorporated into the heavy cream. Continue to whisk the sauce, until it is smooth. Remove the sauce from the heat. Stir in the vanilla extract. 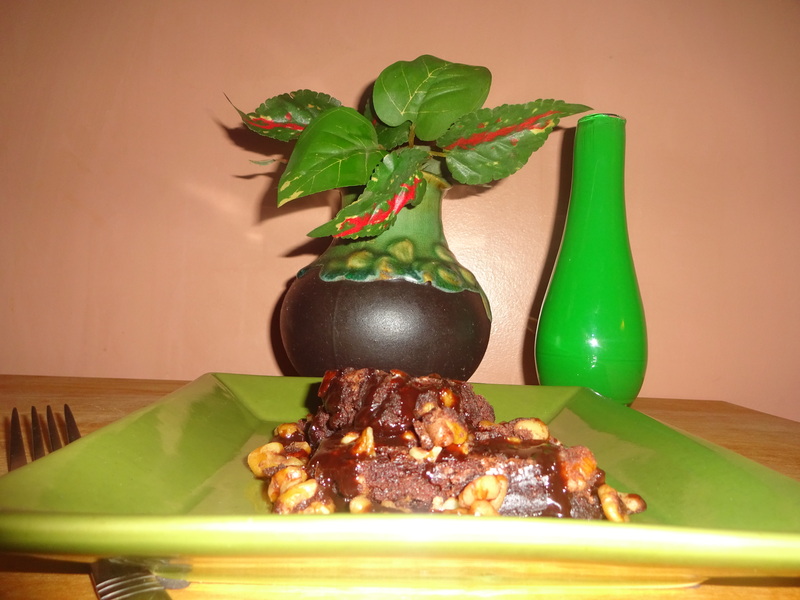 Serve the sauce, warm, over the chocolate bread pudding. Makes One 13-by-9-inch Chocolate Bread Pudding. When I don’t have a certain extract that this cake recipe calls for, I exchange the flavor for another. 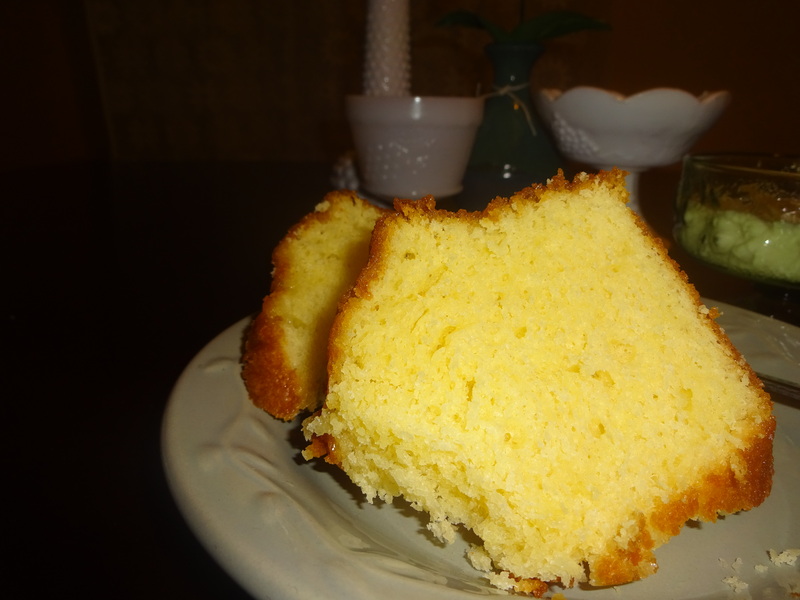 My cousin, Renee, makes a five-flavored pound cake that’s out of this world delicious. I’ve seen flavored pound cake recipes that call for as many as seven different flavors of extract. I’ve seen recipes that call for four, three, two, and of course, one flavor of extract—everything in life, really does depend on what you like…from pound cakes to men. This is a delicious cake, with a tasty, crusty top, and a moist and tender crumb. People won’t know what combination of spices you’ve put in the cake; the extracts meld together nicely, and form one amazing flavor. Preheat the oven to 325 degrees. Grease and flour a 10-inch tube or Bundt pan. Tap out the excess flour. Set the pan aside. To make the cake, in a large bowl, combine the unsalted butter and vegetable shortening, Cream the mixture together, until it is smooth and creamy. Beat in the granulated sugar until the ingredients are light and fluffy. Add the large eggs, one at a time, beating well after each addition. Add the vanilla, lemon, almond, coconut, rum, and butter extracts, blending well, after each extract addition. In a separate bowl, combine the cake flour, baking powder, baking powder, baking soda, and salt. Whisk together the ingredients until they are thoroughly combined. Gradually, add the flour mixture alternately with the evaporated milk, to the unsalted butter mixture. Begin with the flour mixture and end with it. Mix well. Pour the cake batter into the prepared cake pan. Place the pan in the preheated 325-degree oven. Bake the cake at 325 degrees for about 1 hour and 20 minutes, or until the cake is cooked through, and the top of it springs back when you lightly touch it with your fingertips. Remember, every woman’s oven cooks differently. Take the cake out of the oven. Let it cool in the pan on a wire rack for about 10 minutes. Take the cake out of the pan. Place it, right side up, on the wire rack. Put a sheet of waxed paper beneath the rack to catch the glaze drippings. Prick the top of the cake with the tines of a fork. Carefully spoon the Six Flavor Glaze on top of the warm cake. Let the glaze soak in, and drizzle down the sides of the cake. Let the glazed cake rest for about 15 to 20 minutes, before carefully moving it to a cake platter. Let the cake cool completely before serving. To make the six flavored glaze, while the cake is baking, in a heavy saucepan, combine the water and granulated sugar over low heat. Stir constantly, until the granulated sugar has dissolved. Add the vanilla extract, lemon extract, almond extract, coconut extract, rum flavored extract, and butter flavored extract. Over low heat, bring the mixture to a boil, stirring constantly, until the ingredients are combined and fragrant. NOTE: Some cooks prefer to glaze their six flavored cakes while they are cooling in the pan. When the cake is completely cooled—in the pan—they remove the cake, glazed side up—and transfer it to a cake platter. Also, the glaze is an important component of the deliciousness of the cake. I know the addition of all of those extracts sounds a little bizarre, but they really do come together nicely. You can omit some of the flavorings, or change them to lesser amounts, but do not omit them altogether. In addition to its delectable taste, I love the aroma that wafts through my house when banana bread is in the oven—the smell is so homey and comforting. Sometimes I swap the nuts with a 6 ounce bag of chocolate chips; sometimes, I keep the nuts and add a hand full of chocolate chips…or peanut butter chips or butterscotch chips. Preheat the oven to 350 degrees. Lightly grease and flour a 9-inch-by-5-inch loaf tin. Discard any excess flour. Set the pan aside. In a large bowl, beat together the melted butter and granulated sugar. Beat the mixture until it is creamy and well incorporated. Beat in the large eggs, one at a time, vanilla extract, sour cream, and mashed bananas. Beat the mixture just until it is smooth. In a separate bowl, whisk together, the all-purpose flour, baking powder, baking powder, and salt. Mix well. Fold in the toasted pecans. Pour the batter into the prepared loaf tin. Smooth the top of the batter with a small butter knife. Place the tin in the preheated 350-degree oven. Bake the banana bread at 350 degrees for 1 hour, or until it is cooked through and golden brown. Do not overcook. Take the banana bread out of the oven. Let it rest in the loaf tin for about 5 minutes, before turning it out onto a wire rack to cool completely. 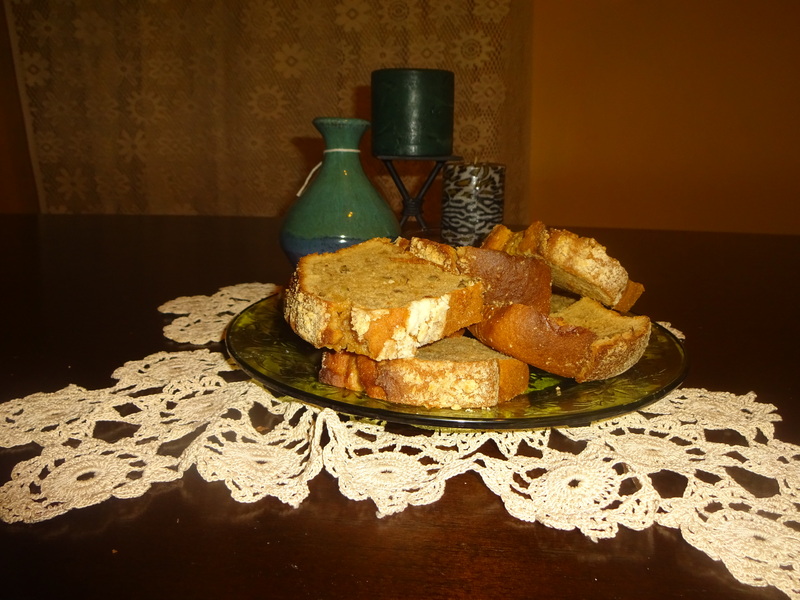 Serve each slice of bread with a sprinkling of confectioners’ sugar. Makes one 9-inch-by-5-inch loaf of banana bread. My childhood friend, Benita Gomez, gave me the recipe for fruit cobbler years ago. As I recall, Benita was the kind of pretty girl who talked incessantly about men and marriage, and how neither would take her zest away. I remember walking home from school with Benita , and her telling me that she was going to be the kind of wife who would keep her dark hair, long and sweeping, and smelling like oranges— Fidel Santiago, who loved oranges, was the boy of her dreams…actually, Fidel Santiago, tall and built, was the boy of every girl’s dreams. Benita would tell me that she was going to be the kind of wife who always wore gorgeous outfits—even to bed—and that she would cook delicious meals, and set beautiful tables, every day. Years later, I still enjoy Benita’s company—she has grown into the kind of woman who gives a well-rounded talk…fashions, politics, electronic innovations, music, and how to keep a husband satisfied. Like she said she would, Benita kept her hair long, and has a standing appointment with her hair stylist to keep it dark and fashionable, and smelling faintly, of spiced oranges. To be truthful with you, she is so kept up, she is the kind of woman that I prefer to visit when my hair and nails are freshly done. Benita and Fidel are married now, despite his bachelorhood forays with bottled-blonds, brunettes, and dark-skinned girls, and like she promised all those years ago, she sets an enviable table, every day, replete with cloth napkins and fresh garden flowers. Benita also keeps a spotless house, with closets full of her husband’s neatly hung shirts and pants, and his bureaus full of ironed socks and underwear. Some women are just designed to be housewives; some women are designed to woo their husbands with pressed clothes and gilded table settings. I’ve heard them say, those are the kind of women who make the best wives. In an oven set at 250 degrees melt the butter in a 9-inch-by-13-inch glass dish. In a medium-sized bowl with a spout, mix together the granulated sugar, all-purpose flour, and baking powder. Mix well. Stir in the milk and vanilla extract. Stir until the mixture forms a smooth batter. Take the dish out of the oven when the butter has melted. Pour the batter evenly over the melted butter. Do not stir. Gently spoon the pie filling down the middle of the batter. Do not stir. Turn the oven temperature up to 350 degrees. When the oven has heated to 350 degrees, about 10 minutes, put the cobbler in the oven. Let it bake for about 30 minutes, or until it is golden brown and some of the batter rises around the cherries. 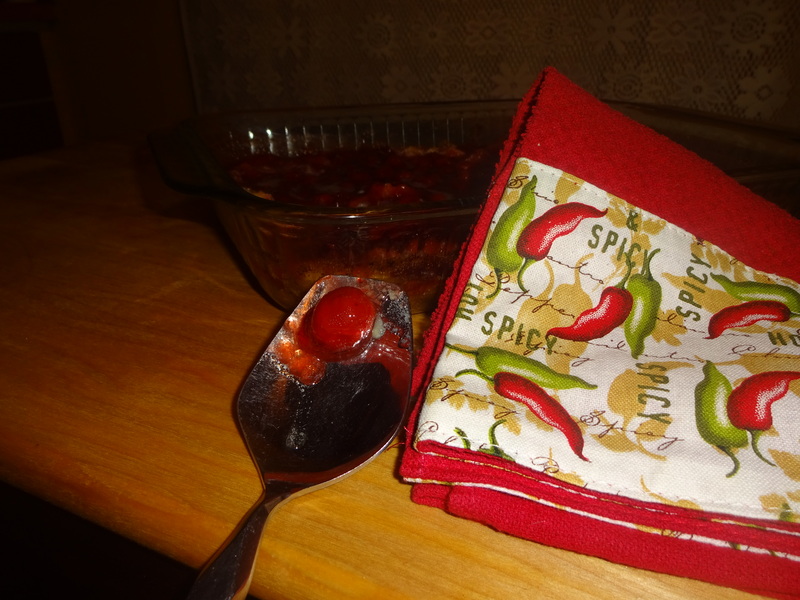 Take the cherry cobbler out of the oven. Serve it warm, with a dollop of fresh, whipped cream, or a scoop of vanilla ice cream. Makes one 9-inch-by-13-inch cherry cobbler. I vividly remember my mother stressing these two important things: open the windows and doors, daily, no matter how hot or cold it is. She said, every house and person needs a waft of fresh air. And, that it was imperative for a woman to maintain a quiet place to rest her mind and feet. “A woman needs to nap every day,” she used to tell me. “Even if you’re not sleepy, go somewhere and raise your feet.” My mother was famous for saying that it was vital for a woman to take some time for herself. “People will work you to the bone, if you let ‘em,” she used to say. 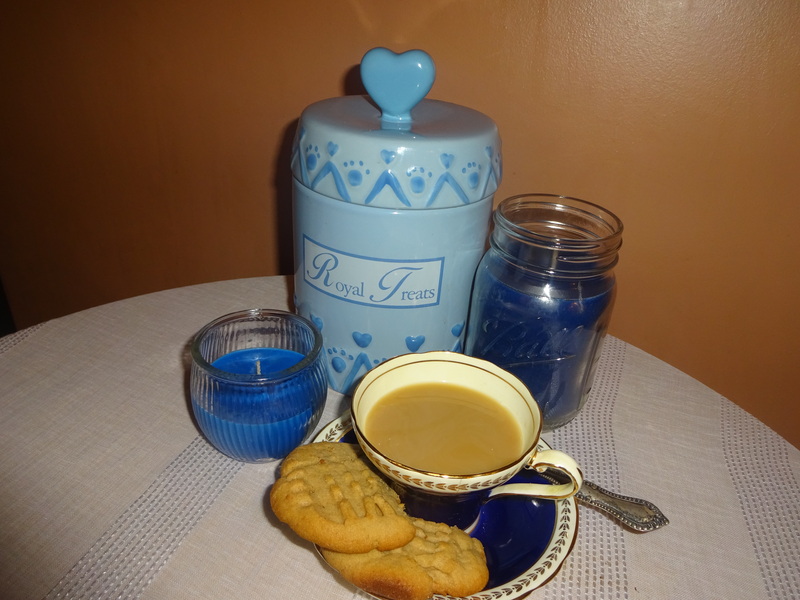 My Aunt Mildred gave this peanut butter cookie recipe to me years ago. I have found that these delicious, classic cookies are the perfect treat to nibble on when I’m resting between my house chores, and swift to bake when I want something sweet and elegant to serve when the ladies come over to talk. I like peanut butter cookies when they’re unadorned—but I also like them when they’re dressed up with chunks of chocolate or butterscotch chips. If the truth be told, sometimes I bake peanut butter cookies for the warm and homey aroma they release…people walk in and feel so at home; they get a whiff of the house, and right away they feel comforted. In that way, fresh, home baked peanut butter cookies also have a perfect love technique built in them. The aroma takes people back to their childhoods. NOTE: You don’t have to put the normal, crisscross fork design in your peanut butter cookies if you don’t want to. My cousin, Michelle, says she never does. Says, for some reason, she hates that pattern. However, I do sprinkle the tops of most of my cookies with table sugar. Preheat the oven to 350 degrees. Lightly grease 2 cookie tins. Set them aside. In a large mixing bowl, combine the butter, peanut butter, granulated sugar, and light brown sugar. Mix until the ingredients are well-combined. Add the eggs, one at a time, mixing until they are well-incorporated. Stir in the vanilla extract. In a separate bowl, whisk together the all-purpose flour, baking powder, baking soda, and salt. Stir well. Gradually stir the flour mixture into the into the peanut butter mixture until the mixture is well–blended. Shape the dough into 1- ¼ inch balls, larger or smaller, if you prefer. Roll each ball of dough into granulated sugar. Drop the balls, 2-inches apart, onto the prepared cookie tins. Using the tines of a fork, flatten each ball with a crisscross design. Place the cookies in the 350-degree preheated oven. Bake them for 8 to 10 minutes, or until they are light brown, and the cookies are set. Take the cookies out of the oven. Let the cookies cool on the cookie sheet for about 5 minutes. Using a cookie spatula, move them to a wire rack to cool completely. Makes 3 to 4 dozen peanut butter cookies.